Body sculpting is a kid-favorite activity that I've loved since my early days of student teaching. Little bodies morph into lumps of clay, easily manipulated by little hands that are endlessly creative in re-imagining the human form as abstract and representational art. I tingle just thinking about it. Begin by one child becoming a lump of clay, the other a sculptor. The child who is sculpting gently moves a body part of the clay who then holds that body part in place. The sculptor keeps working, gently moving a single body part at a time until the sculptor feels like the sculpture is complete. Once the sculptor is finished, the kids can change roles. 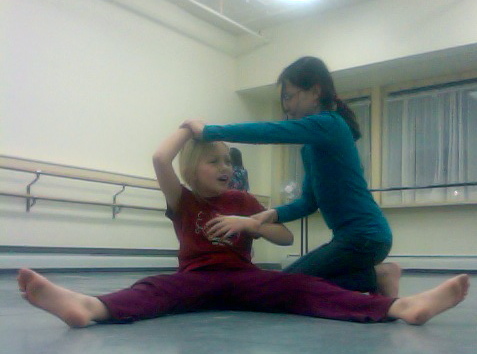 Sculpting, like most creative movement explorations, can be morphed to suit the group or the theme of a longer lesson. Participants can work in a small group with one sculptor sculpting many pieces of clay. You could try having multiple sculptors working together. Create a theme for your sculpture work or make it relevant to a larger lesson - I often explore characters during my work as an education outreach educator for a local opera company using sculpting. Kids can sculpt adults and adults can sculpt kids. One of my favorite variations is the sculptors directing the sculptures to "come alive" and then the kids moving however they think their sculptures would move. Encourage participants to work without speaking. One of my favorite teaching moments was watching a gymnasium full of kindergartners quietly manipulate the bodies of their peers in total concentration. Move your clay gently and slowly. I was fortunate enough to spend many afternoons with a very energetic young boy while I was a college student and we would often relax by doing some gentle, purposeful sculpting. Encourage sculptures to move many body parts and be as specific as possible. Remind kids about faces, fingers, knees, hips, and shoulders! Give kids freedom. Sculpting is a complete structure that allows for a fair amount of freedom while guiding with safety and consideration rules. Let kids make their own choices and try to see the art from their eyes and hearts.